Making time to be together, whether relaxing on a beach or browsing through a busy farmers? market, family vacations are a time to make memories. 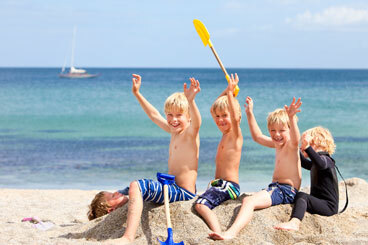 Here are some ideas to make the most of your family vacations. Camps for Children & Families – The Manitoba Camping Association accredits children's camps and family camps. Check out their camp directory here. Find Your Favourite Park – Use this online guide to read descriptions of Manitoba?s parks as well as directions to find them. Interpretation Programs – Find a program for your favourite park. Interpretive Educational Programs – Discover a park?s natural and cultural history. Park interpreters conduct programs designed for all ages. Manitoba Farmers' Markets ? Check out the Manitoba?s Local Produce Guide for a listing of farmers? markets, pre-picked market stands, u-pick vegetable gardens and community supported agriculture farms across our province. Preparing for An Out of Country Travel Vacation A family vacation is a great way for families to spend some quality time together. However, without proper planning, an out of country vacation can sometimes be stressful. Having some basic information about your destination, such as any important travel rules or any safety considerations (common local illnesses, weather) can go a long way in helping you prepare for your vacation. Travel Manitoba – Your guide to hundreds of touring and accommodation services, travel information sources and tour packages. Travelling with a Child: Documents & Legal FAQs – Find out what documents are required by a child travelling alone or with one parent or guardian, how to get a passport for your child, and what to do if a custody dispute arises while your child is abroad. Traveling with Children – Tips on how to pack items for babies and young children, what to do at the screening checkpoint, and if needed, how to travel with the family pet.